Some things in life are simple. 1+1=2, beach + margarita = holiday and cinnamon + sugar = awesomeness! When I chanced upon this recipe, I was skeptical. The ingredient list was small. The process was easy. And the final product seemed very basic. But the more I kept thinking about the muffin that’s going to be coated with cinnamon sugar, the more I wanted to make it. The story goes back a couple of years – in a mall in Bangkok. (It’s nothing like the Hangover II, so get your mind out of the gutter!). Now BKK is a shopper’s paradise. I landed and checked myself into a hotel which was bang opposite one their biggest malls – yes, I had my priorities in order! The city is hot as hell, so it’s very thoughtful of the government to connect malls to other malls via air-conditioned pathways. The end result being, you feel you are in the biggest mall on the planet! My daily routine consisted of getting up early, grabbing a quick brekkie at the hotel café and waiting till the mall opened at 10 AM. As soon as the first store opened it’s shutters, I was in shopping mode! Like a ninja on a mission, I went from store to store and floor to floor – looking, comparing, bargaining and buying. The only break I took was a loo break and a lunch break. Ok, so I’m crazy! Luggiing my loot around (I used a big suitcase with wheels :P), I finally saw it. A pretty little bakery done up in pink and dark brown – like candy and chocolate. I was inexplicably drawn towards it – I completely empathize with Hansel and Gretel! There were rows and rows of all the goodies you could imagine – doughnuts, layer cakes, cupcakes, pastries, tarts, truffles and I could go on! I put as many things I could on the tray along with a sugar bun that also made its way there. I sat down to enjoy my sugar coma inducing meal. And you know what the surprise package was? 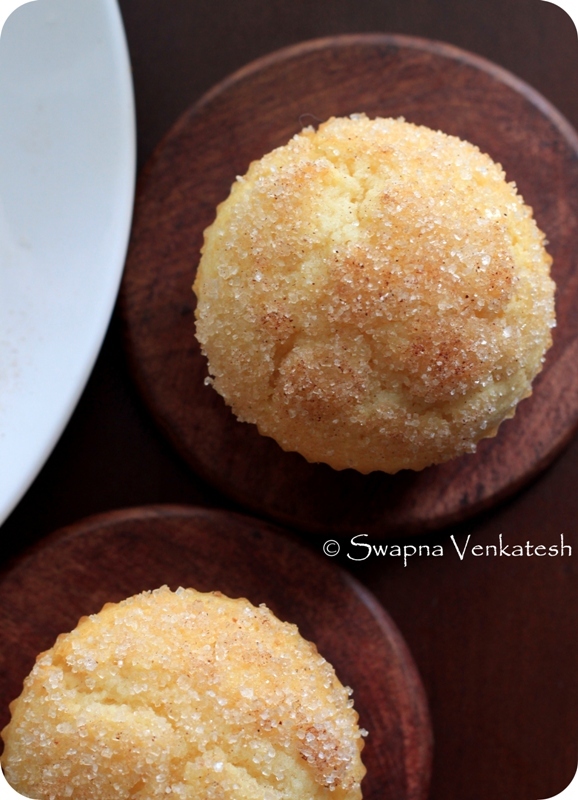 – The tiny little perfect sugar coated butter bun! I have dreams about it some days (no kidding!). So the climax is simple. 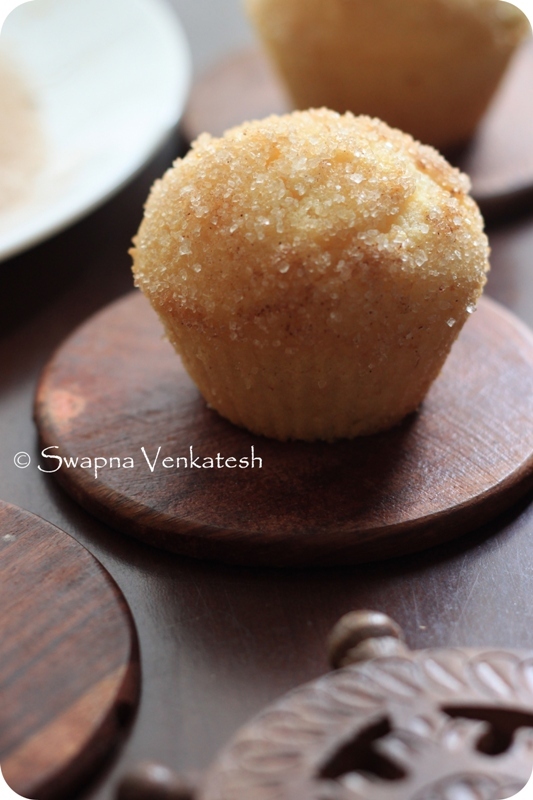 The sugar coated muffin = my substitute for the sugar coated bun. And I’m currently patting my stomach with a Looney smile plastered across my face. Enough said. Preheat you oven to 180°C. Line 10-12 muffin cups with liners. (I didn’t have liners, so I just used my silicon muffin tray with good results). Toss in the nutmeg, cinnamon, salt and baking powder into the flour. Sieve to ensure uniform distribution of the dry ingredients. In another bowl, beat the egg gently, add the milk and sugar. Mix well. Now add in the melted butter. (Ensure it is not hot, otherwise it could scramble the eggs). 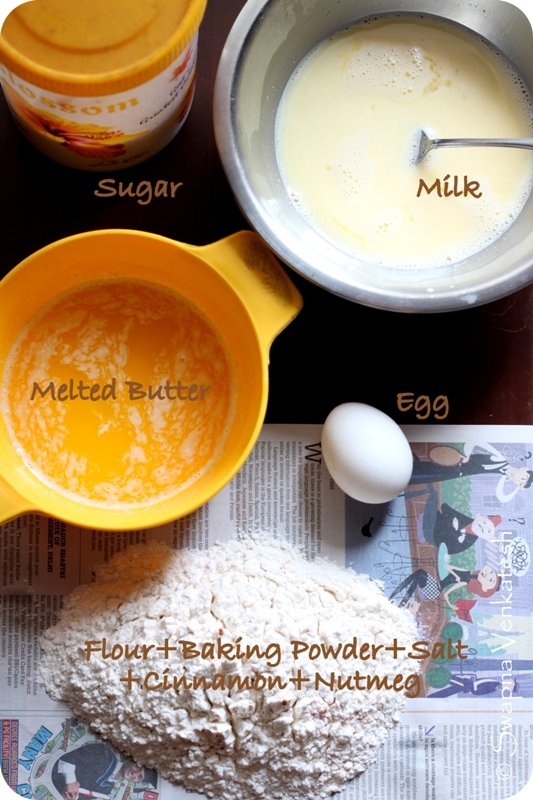 Mix the wet ingredients with the dry ingredients, until just combined. Split the batter among the muffin cups (I got just 10). Bake in the hot oven for 18-22 mins. (I baked it for 20 mins). 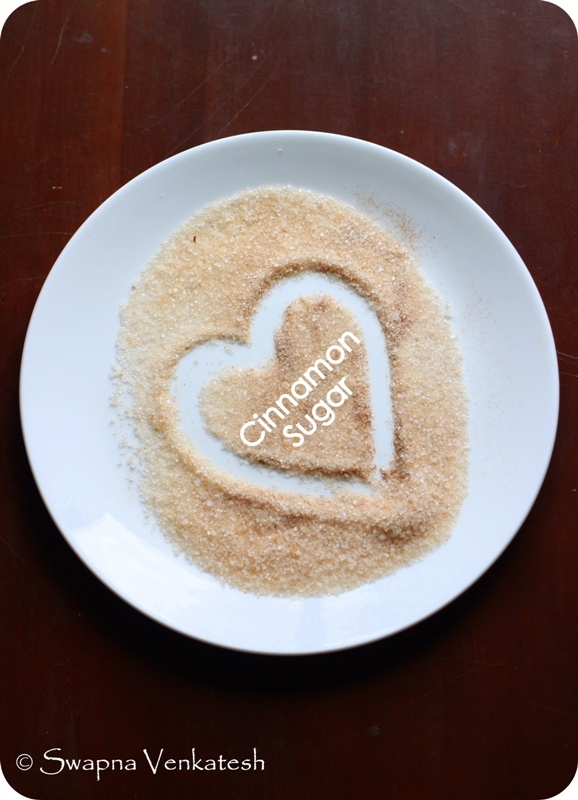 While the muffins are baking, mix the sugar and cinnamon in a flat plate. Run your fingers thru it and ensure they are well integrated. Keep the melted butter aside. P.S. The muffins taste best the day they are baked… not that I expect any to be left for the next day! Drool drool… Swapna… drool.. I just wanted to say.. drool drool.. oh darn.. drool I think I just short-circuited my keyboard…fizz..bang… sizzle..blue screen of death..